8. Click “Submit,” and you’re done! Your appointment requests will be automatically approved. An email reminder will be sent from the system as soon as you hit “Submit.” You must submit an appointment request at least one hour before the time you hope to meet. The system will only allow cancellations no less than one hour before a scheduled meeting. 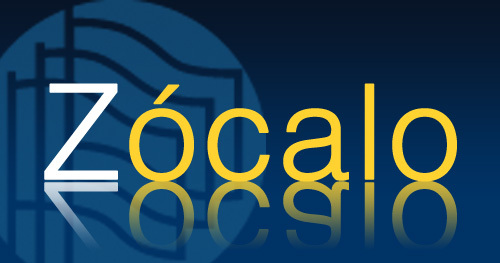 This article is for students and alumni using Zócalo. Say you’re tooling around in Zócalo, clicking through employer records, and you find an organization you’ve never heard of that looks interesting. You’re delighted to find that many of the organization listings you’re looking at have robust profiles, and all contain links to their websites. You don’t have much time to devote to your career research right now, but you’d like to explore more at a later date. What next? 1. Click on the Employers tab. Use the search fields to narrow down the list of organizations you’re reviewing. (ex. : Industry: Education: Higher Education, State: California will currently narrow the list down to 34 organizations. 3. 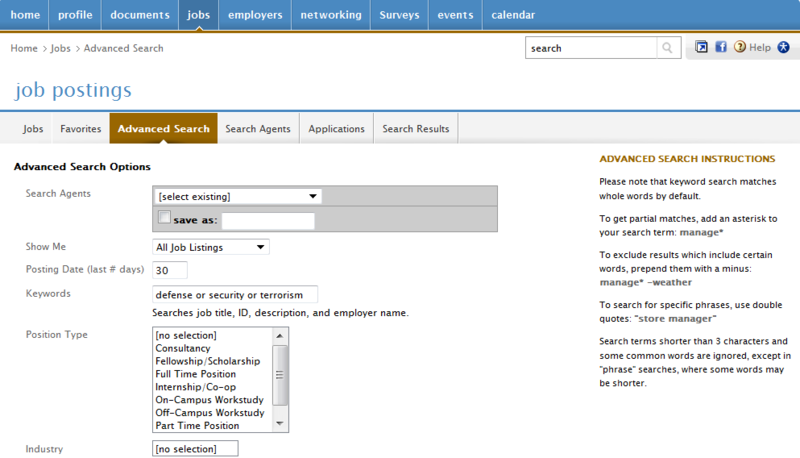 You can also save your “favorites” in the Jobs section with jobs, internships and fellowships! After logging in to Zócalo, click on Jobs and then click on the Advanced Search tab. Click on the checkbox next to Save As and give your search a name. To begin with, you may want to ask your search agent to give you all jobs posted within the last 30 days. In the Industry field, you can multiselect various industries (i.e. Language Services and Language Teaching). You can multiselect by holding down the CTRL key while making your selections on a PC, or by using the CMD key on Macs. If you use BOTH the keyword search field and the Industry field, your results will consist of only those jobs that contain one of your keywords AND one or more of the industries you’ve selected (i.e. “Language Line” AND Language Services AND/OR Language Teaching). Select Position Type and location criteria, if any. The “Jobs located within: miles of zip code:” field works as long as the City and State have been entered in the job posting (this isn’t always the case! ), so this may be something to play around with. The other fields listed aren’t really used in our system. Click Submit. You’ll be taken to the Search Results tab, where you can click on the job title to be taken directly to the position description. Your search agent will now be saved under the Search Agents tab. From here you can edit, schedule, run or delete your search agent(s). To edit: after clicking on the edit button, be sure to click on Save As button, or your changes will not be saved. Make your changes and hit Submit. To schedule: If you would rather receive your job update emails in a daily, weekly or monthly digest, rather than every time a new job comes in, click on Schedule. In the field entitled Enabled on the new screen that appears, click Yes. By filling in the Period and Multiple field, you can customize the frequency of your emails (ex. every 2 days, or every 3 months (not recommended!)) You can also choose to only see new results or to receive everything that is currently “live” in the system. Happy job and internship hunting! This post contains step-by-step instructions on how to enter employers, contacts, jobs, internships and fellowships into Zócalo. This post was written for staff and graduate assistants with Manager access to the Zócalo system. If the employer is not already in the database, please add it using the guidelines below. Otherwise, skip to Entering Job Postings. If there are multiple positions for the same organization (more than three), you may input one job with the title, “Multiple Positions.” Check with an advisor if you believe the positions are with an organization with whom we have a close relationship, or if representatives are coming to campus to recruit for the positions. For Center for Advising and Career Services Graduate Assistants: Place all e-mails into the “COMPLETED” folder in Outlook. How do I log into Zócalo? Current students will use their exchange (email) login and passwords to gain access to Zócalo. Your user name is everything before the @miis.edu in your email address and your password is exactly the same password as your email password. If you have trouble accessing Zócalo it most likely because your email password has expired. If this is the case, simply set up your email or reset your password online. 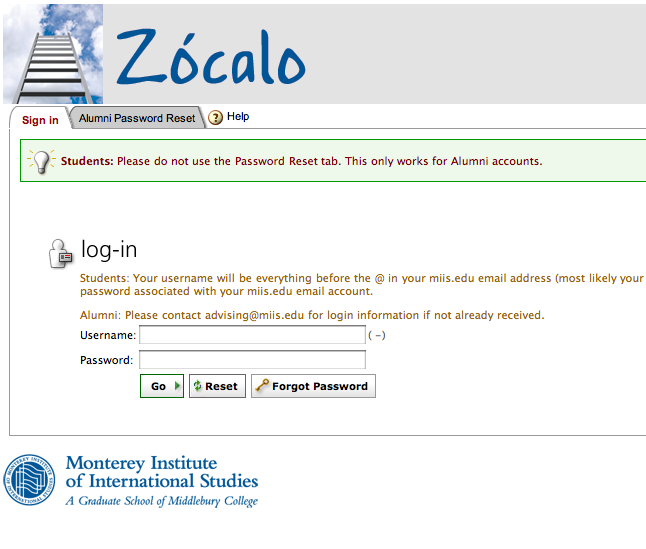 Contact advising@miis.edu if you continue to have problems signing in to Zócalo.